1. 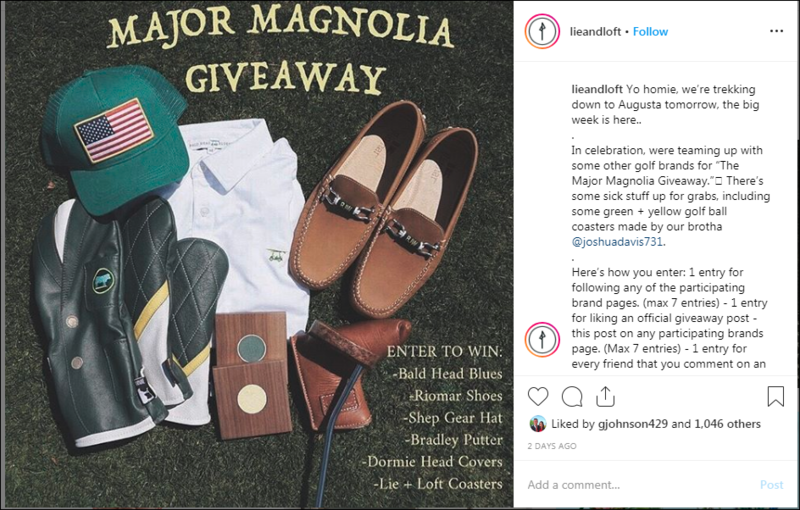 Lie + Loft Instagram contest - This is a great package containing a variety of different high end golf boutique items. It includes a Bradley putter, Riomar shoes, and DormieHead Covers. Their account is also generally filled with fun golf items and golf decor for your home, so it's a great account to have in your feed. 2. Hookedongolfblog.com Twitter contest - I don't know much about this golf blog, but the prize they are offering is awesome. 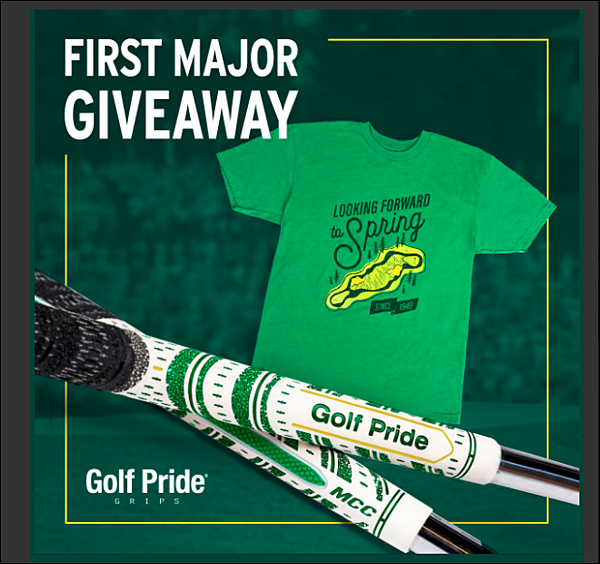 If you win this contest, not only will you receive this one-of-a-kind t-shirt, but also new Golf Pride grips for your entire bag! 3. 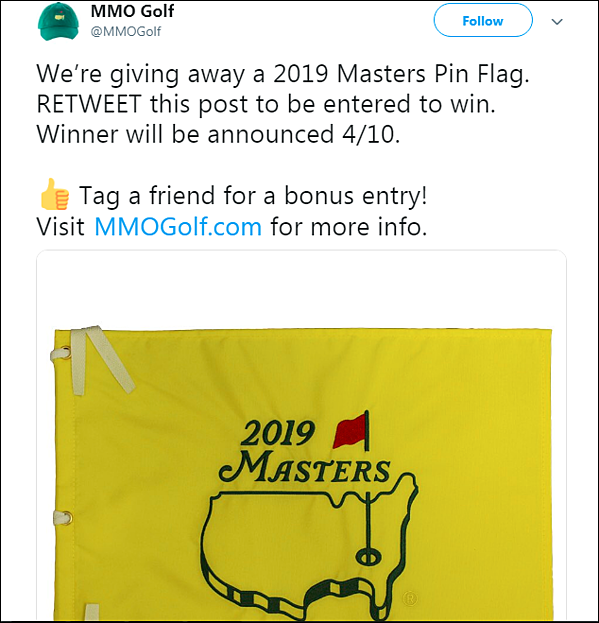 MMO Golf Twitter contest - How cool would this Masters flag be hanging up in your home or office? MMO Golf's site offers all sorts of Masters gear, so if you don't win the contest you can order something cool from their site. 4. 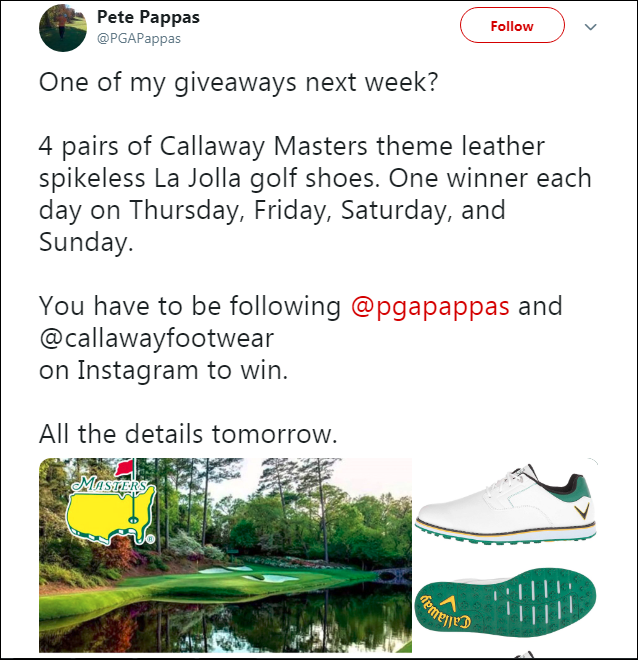 Pete Pappas Twitter contest - These Masters themed golf shoes from Callaway are truly beautiful! Pete Pappas is also a great follow as he is a knowledgeable golf writer and analyst and does giveaways on a pretty regular basis. 5. Bobby Jones contest - Want an entire new golf wardrobe? 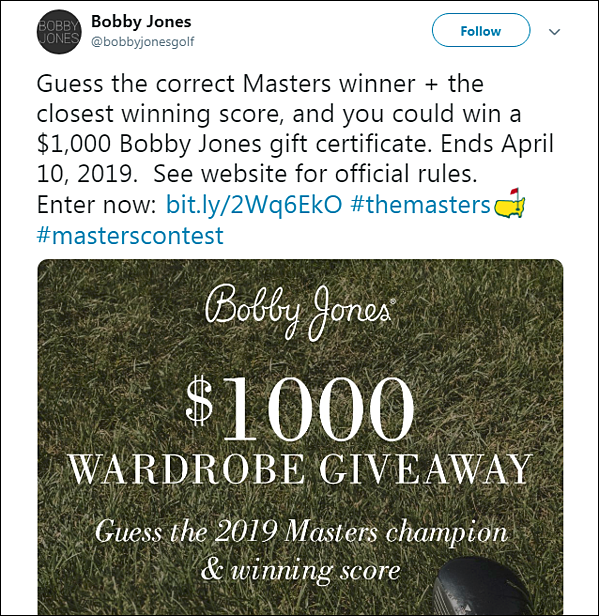 If you win this contest, the prize is $1,000 of golf apparel from Bobby Jones. If you've never visited their site, they have some pretty awesome stuff between throwback shirts and pants to more modern golf wear. These aren't the only contests out there, so be on the lookout for other awesome giveaways over the next few days. See any particularly cool ones? Be sure to tag us on Twitter or Instagram so we can share with the rest of our audience.